Alkalinity is the ability of water to neutralize acids. It is generally caused by the presence of carbonates, bicarbonates and hydroxides produced by rock - limestone, for example - being weathered by water. Alkalinity is expressed as milligrams per liter calcium carbonate; low alkalinity water has less than 75 mg/liter, high alkalinity water has more than 150 mg/liter. Hardness is a measure of calcium and magnesium ions. Hardness measures are often similar to alkalinity. Hard water lakes are usually more productive than soft water lakes. Hardness is expressed as mg/liter calcium carbonate with soft water ranging from 0 - 75 mg/liter and hard water from 150 - 300 mg/liter. The concentrations of hydrogen ions in water is expressed as pH. The pH scale ranges from 0 (very acidic) to 14 (very alkaline) with 7 being neutral. Most aquatic plants can tolerate a reasonable pH range but they function best when the pH is around 7. Chlorides usually occur in low concentrations in natural lakes, but excessive pollution may increase in chloride presence. Chlorides are not harmful, but are often associated with pollutants and therefore are a general indicator of contamination from human activities. An ample supply of dissolved oxygen (DO) is one of the most important components necessary for a normal aquatic community. Warmer water has less dissolved oxygen due to the fact that oxygen solubility decreases as water temperature increases. The stratification of a lake is important to the level of dissolved oxygen . A dissolved oxygen concentration of 6.0 mg/L is sufficient for all species of fish that would live in both Fumee lakes. Concentrations below 2.0 mg/L would probably result in stress or discomfort in most fish species and few fish would be found in such locations for any length of time. 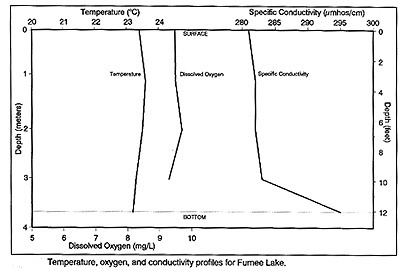 Fumee lake had a DO concentration of 10.45 mg/L at the top and 8.6 mg/L at the bottom. In Little Fumee Lake the DO at the top was 9.15 mg/L and remained high throughout the surface layer. After 5 meters the DO began to rapidly decrease; at 6 meters the DO was 5.75 mg/L and at 7 meters that dropped to 0.8 mg/L. The reason for decreased levels of oxygen near the bottom is the respiration of bacteria and phytoplankton. Generally the more nutrients in a lake, the greater the oxygen depletion. Little Fumee Lake appears to be a fairly productive body of water. ​​Conductivity is a general indicator of productivity. It is the ability of the water to conduct an electrical current. A high conductivity indicates significant amounts of dissolved substances in the water. Conductivity is reported in units of microhos per centimeter of water at 25o due to the influence of temperature on conductivity. This is called specific conductance or specific conductivity. 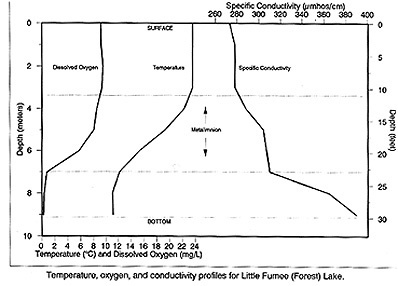 The specific conductance in the surface waters of Fumee Lake was 272 microhos/cm, and 265 microhos/cm for Little Fumee Lake. These values are typical for lakes having relatively hard water. Transparency / Visibility has to do with the the effect that light has on the water in a lake. Light has an effect on the whole series of biological events in the water. A common device used to determine water transparency or visibility is a Secchi Disk; a black and white disk, 20 cm (about 8 inches) in diameter. The Secchi disk is attached to a calibrated line and is lowered into the water to the depth at which it disappears. The disk is then lifted until it reappears. The arithmetic mean of the two depths is considered the Secchi disk transparency or limit of visibility. The Secchi disk reading for Fumee Lake was 3.0 meters. When this measurement is compared with other Michigan lakes (116 were measured), Fumee Lake ranks at the 69th lake. This means that 69 lakes in Michigan have clearer water than Fumee Lake. Little Fumee Lake has a reading of 3.2 meters which ranks the lake at 63rd in the state. Nutrients are needed by algae and other aquatic plants for growth. Algae is the base of the food chain and is needed in sufficient amounts to promote good populations of higher aquatic organisms. The three major nutrients used by plants are carbon, phosphorus and nitrogen. Carbon is readily available in the form of carbon dioxide and is usually of no concern. Both phosphorus and nitrogen are of greater concern because they are the nutrients that limit the amount of plant and algae growth in a lake. This growth determines the trophic status of a lake. An increase in the level of these nutrients will often result in excess amounts of algae and aquatic plants. 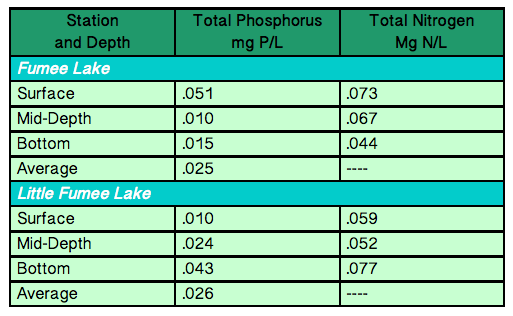 Values for total phosphorus in both lakes was slightly high. The concentrations, however, do not seem to be causing a problem with macrophyte and algae growth. Phosphorus is usually the nutrient that limits plant growth since there is so little naturally. There is a rather high concentration of total phosphorus for the phytoplankton occurring in the lakes. Phosphorus can adsorb certain materials and make it unavailable to organisms. Nitrite (NO2) and nitrate (NO3) were very similar for Fumee Lake and Little Fumee Lake. In Fumee Lake the values were slightly higher at the surface and the mid-depth than at the bottom which is typical of a shallow lake. Little Fumee Lake had increased values with depth, as is typical of deeper lakes.